Some of you might already know this, but I've been writing for a local paper here in Limerick for the past 9 months. I share my old projects in the home section and I've really loved it! 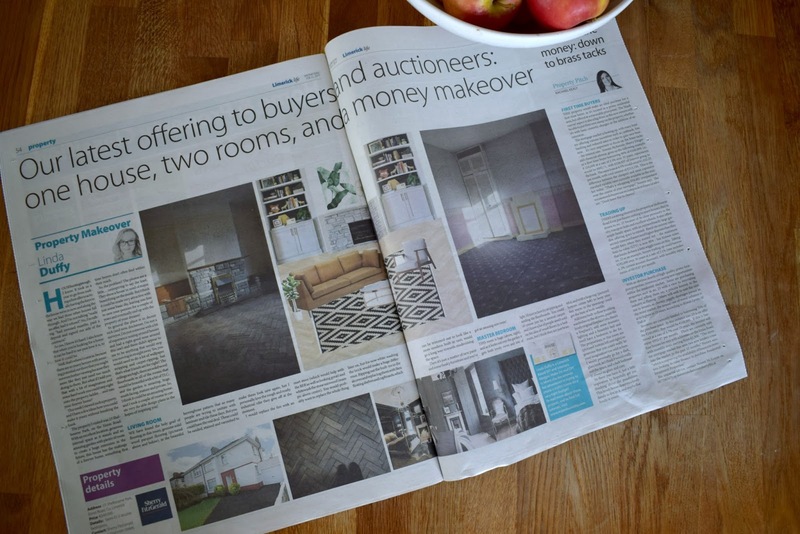 Recently though the editor approached me with a really interesting proposition...would I be interested in viewing a "fixer-upper" house currently for sale and give my opinion on what could be done with it? And as it involved two of my most favourite pastimes (being nosy and telling people what to do) of course I said yes! So, it's a bit different from my usual style as it was written for a completely different audience, but I thought I'd share it here anyway. If any of you are in the process of looking for your first home it might encourage you to give the ones that need some work a chance! House hunting is tough. I know. It took us a year to go from making a first offer to actually having the keys to the house we’re in now, and along the way we had three (yes THREE!!) other houses fall through. And I’m not talking “made an offer, had it refused”, no, I’m talking “had invested months, paid a deposit and signed our side of the contracts”. So yes, I know it’s hard. I also know that when you’re looking for a home it can be hard to see past how it is, to how it could be. Well, that’s where I come in, because there are so many houses with amazing potential out there that you might not even bother viewing because they seem like they just need too much doing to them. But what if I told you that with a bit of imagination and some hard work you could step right onto the property ladder….and into your forever home? This week I viewed such a property, and I have a few ideas how you could make it yours without breaking the bank. The property I visited was 23 Shelbourne Park, on the Ennis Road. With an excellent location, generous internal space as it stands and an amazing garden with plenty of room to create a huge extension in the future, this house has the makings of a forever home, something first time buyers don’t often find within their reach. So, the problem? The photos are a little….uninspiring to say the least. 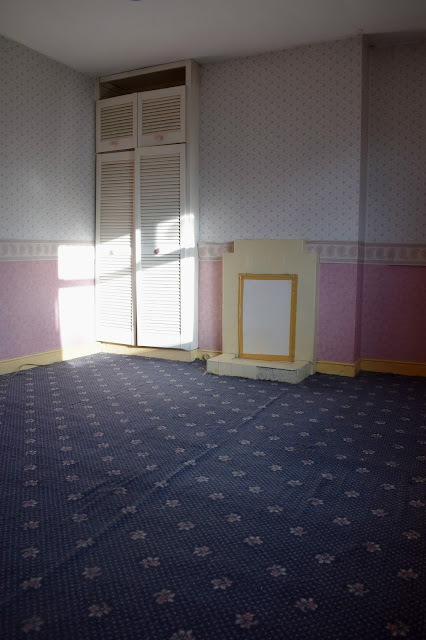 They show a house in need of major beautifying on the inside. But I think it could be made very attractive with just some basic diy, leaving you free to save your pennies for a couple of years and eventually end up with the property of your dreams! In general the place is in decent nick (and now, disclaimer, I’m not a surveyor, I’m just someone with a bit of experience nosing around houses and had a right good nose around this one) and there didn’t appear to me to be anything that would stop you moving in straight away. Yes, you would need to do a lot of wallpaper stripping and carpet-ripping, but that’s what friends are for right?! 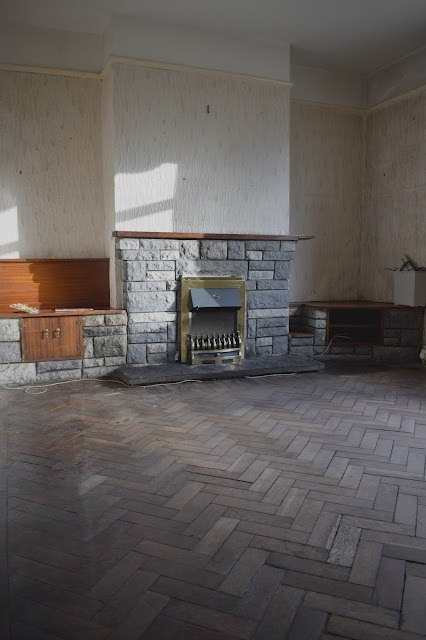 The ceilings are high, there are solid wood floorboards in all of the rooms that would be beautiful with a bit of TLC, and the garden is amazing, huge, south facing, mature and private. So, I think it could be an amazing home, and I took a couple of rooms to create very do-able design plans for in the hopes of inspiring you! 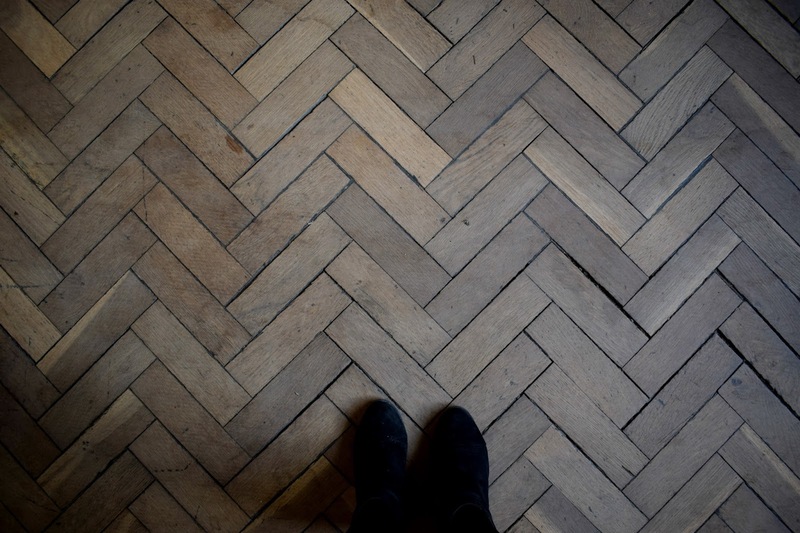 We have found the holy grail of flooring in this room, genuine solid wood parquet flooring, in the beautiful herringbone pattern that so many people are trying to imitate with laminate and tile these days, but you could have the real deal! These could be sanded, stained and varnished to make them look new again, but I personally love the rough and ready, industrial vibe they give off at the moment. Pardon my amateurish mood board skills!!! I would replace the fire with an inset stove (which would help with the BER as well as looking great) and white wash the stone surround. You would probably want to replace the whole thing later on, but for now white-washing the brick would make a huge difference. Ripping out the built-ins in the alcoves and replacing them with Ikea floating shelves and cupboards which can be trimmed out to look like a more modern built-in unit would go a long way towards modernising the space. Then it’s just a matter of new paint and some funky furniture and you’ve got an amazing new room! This room is huge, and as it looks out over the garden it gets both lovely views and lots of light. I’d start in here by stripping and sanding the floorboards. 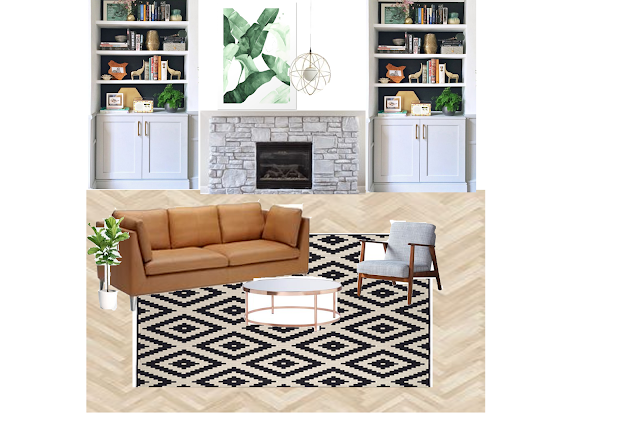 You could of course just lay a neutral carpet, and I know a lot of people aren’t sold on the idea of wood floors in a bedroom, but I think they are just beautiful, and with a large rug to keep your feet warm in the mornings you’d get the best of both worlds. 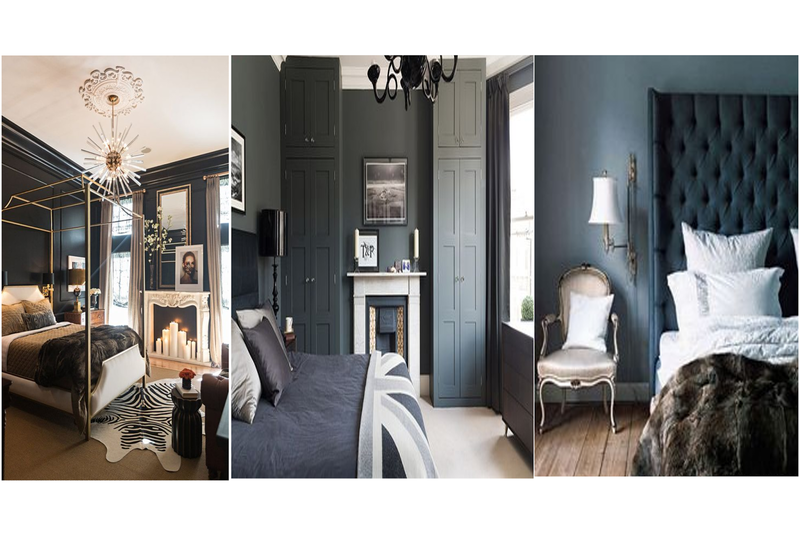 Add some built-in floor to ceiling wardrobes in the alcoves, paint the lovely original fireplace (yes, there’s a fireplace! ), add some dramatic lighting and a beautiful bed and you’d have a bedroom to die for. The proportions in this room are so generous that you could really let your imagination run wild in here. I would personally go for a dark, glam look, as I think it would really suit the space, and a dark bedroom is always so glam and cosy. So there you have it, just a little inspiration to hopefully get you thinking about the possibilities. This lovely house deserves a lovely family to live in it, and maybe that family is yours.